We are sending thousands of books as a result of our full-page newspaper ads. We are currently working with a major daily newspaper that will reach many millions of people. These full-page advertisements speak clearly about the issue over the Sabbath/Sunday debate. We publish all the Bible verses that show how the Sabbath has never been changed, including the misconceptions that Christians have regarding Sunday-keeping. We also gave a warning about the Sunday laws that are soon coming. Please pray that many will come to a knowledge of the truth through these efforts. We also advertise a free book offer and, yes, we are sending copies of The "Real" Great Controversy to those who call in. For the glory of God, we have been sending books and literature to people who want more information after seeing this full-page ad. “The Sabbath will be the great test of loyalty, for it is the point of truth especially controverted. When the final test shall be brought to bear upon men, then the line of distinction will be drawn between those who serve God and those who serve Him not.” Great Controversy, p. 605. I n our billboards, we offer a free book. 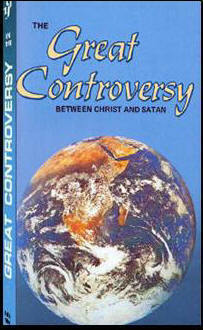 And the book that we send is a copy of The "Rea" Great Controversy. We have about 40 billboards through the United States and in Central and South America. Over the last 20 years we have had upwards to 100 billboards. Hundreds of thousands of cars pass through out billboards each day. A real message is being presented as well as a free book offer. Hundreds of calls come in each month requesting the free book offer. 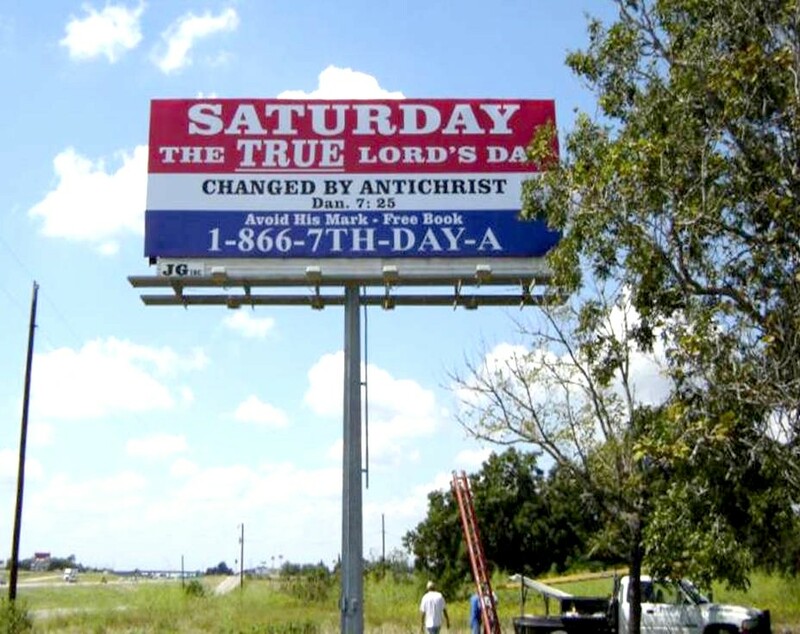 The billboard’s message is a summary of the final warning message—the Great Controversy’s theme between the worship of the true God versus the false god Antichrist. The Lord’s true Sabbath day is a clear, distinct, and eternal sign that commemorates and declares God as Creator and Redeemer. We know from Scripture that God created the world in six days and He rested the seventh day [Gen. 2:2]. He then blessed and sanctified the Sabbath [Gen. 2:3]. He gave it to us by commandment, written in His law [Exo. 20:8-11]. 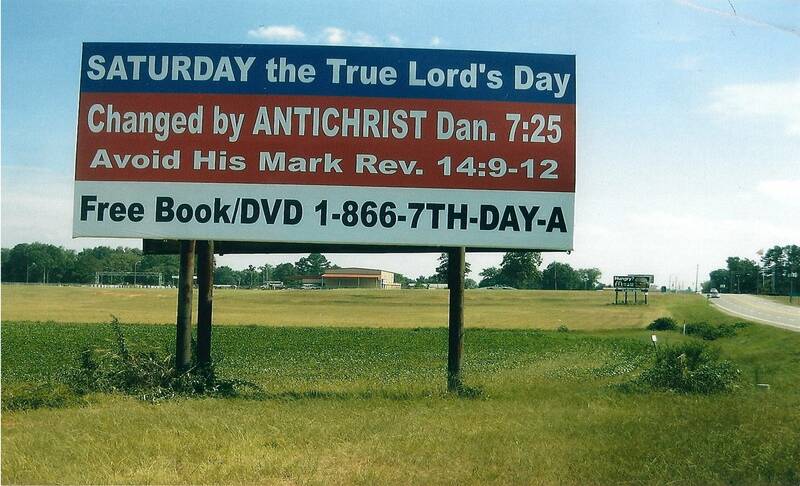 While on earth, He kept the Sabbath [Luke 4:16] and instructed His disciples to commemorate it too [Matt. 24:20]. And thr oughout eternity, from Sabbath to Sabbath we will all come to worship Him [Isa. 66:23]. The Sabbath will never pass away [Psalms 89:34]. We are to rejoice in His Sabbath (Isa. 58:13) for it is a sign between God and His people (Eze. 20:20). It is also a sign to remind us that He is also our Redeemer who sanctifies us (Eze. 20:12). It is a monument of His love toward us (1 John 5:3, John 14:15). This Sabbath message is to be proclaimed to the entire world [Rev. 14:6-12]. In contrast, the Antichrist power of the last days believes that he is greater than our God [2 Thesa. 2:4. This power speaks words against the most high and has attempted to change times and laws, specifically the Sabbath commandment [Dan. 7:25]. This “ Sunday” worship is considered an abomination to God [Eze.8:16]. Through “peace” it is determined to destroy humanity [Dan. 8:25]. It has the world captive and drunk on its false doctrines [Rev. 17:2]. This is the abomination that will bring in the final desolation for the entire world [Matt. 24:15]. Also known as the “man of sin, the son of perdition” [2 Thesa. 2:3]. This antichrist power takes the name of “Holy Father,” a name that belongs to God alone [John 17:11]. He is compared to Christ and is served by all the world [Rev. 13:3, 4]. In the end, this power will be destroyed with the devil and all those who follow his falsehoods [Rev. 19:20, Rev. 20:10]. The Third Angel’s Message gives a world-wide warning against Sunday worship—the “mark of the beast” [Rev. 14:9-11]. “The Third Angel’s Message is to be given to our world in clear, distinct lines.” 14MR 158. “And the Lord answered me, and said, Write the vision, and make [it] plain upon tables, that he may run that readeth.” Habakkuk 2:2. “We must take every justifiable means of bringing the light before the people. Let the press be utilized, and let every advertising agency be employed that will call attention to the work. This should not be regarded as nonessential. 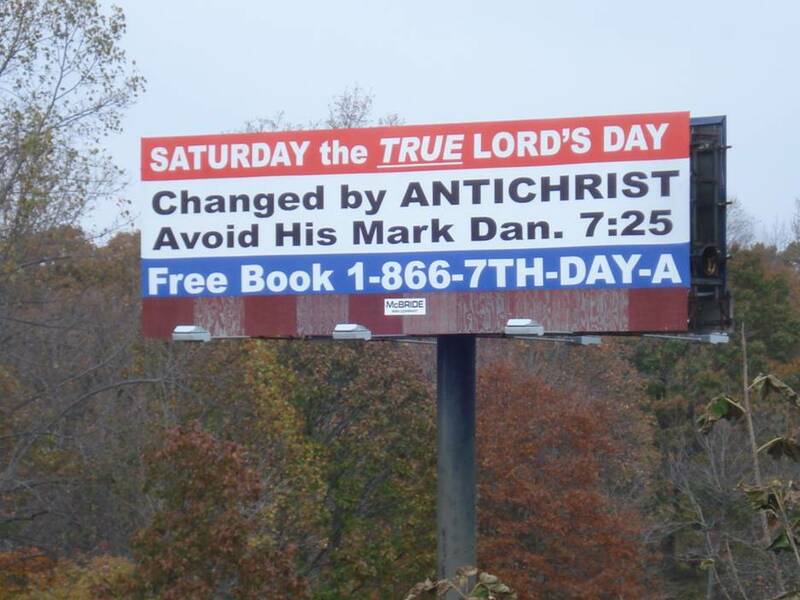 On every street corner you may see placards and notices [billboard advertising] calling attention to various things that are going on, some of them of the most objectionable character; and shall those who have the light of life be satisfied with feeble efforts to call the attention of the masses to the truth?” Evangelism, p.130. It is truly a blessing to be able to participate in the proclamation of this most important truth. As we write, multitudes are being exposed to the final warning message. And you who help support this ministry are making all of this possible. In the end, what will matter in the heavenly register is the work and ministry that we do for the Lord in reaching souls with the final message of hope. “In the cities of today, where there is so much to attract and please, the people can be interested by no ordinary efforts. Ministers of God’s appointment will find it necessary to put forth extraordinary efforts in order to arrest the attention of the multitudes. And when they succeed in bringing together a large number of people, they must bear messages of a character so out of the usual order that the people will be aroused and warned.” Gospel Workers, p. 345. These billboards are reaching people who would otherwise never be reached. These billbo ards are “extraordinary efforts.” People are calling in. Our free literature is being sent out. Your faithful prayers and support are making all of this possible. We thank God for the brethren who are standing together with us. God bless you!